Product prices and availability are accurate as of 2019-04-15 01:25:00 UTC and are subject to change. Any price and availability information displayed on http://www.amazon.com/ at the time of purchase will apply to the purchase of this product. Enjoy giving? Use the complete gift box sets of MyPresentForYou. Wrapping your gifts is a breeze with this cute set of Gift Boxes! Use these boxes to house your favorite gifts including cupcakes, cookies, baby items or Spring gifts like succulents, decorative candles, scarves and more! All in one. All you need to wrap up your gifts, cookies, bakery products or small apparel in ONE SET: You will receive 10 gift boxes PLUS 10 shiny butterfly pull bows AND 10 sheets of tissue paper. Quality is key. Our gift boxes are sturdy and easy to fold. Beautiful butterfly pull bows The shiny butterfly bows are made of smooth poly ribbon. They come as flat strips for easy storing and come up like magic by pulling the two ribbon ends. Tissue paper. To prevent damaging your presents or goods use the tissue paper to wrap around it. Reusable. Gift boxes and butterfly pull bows can be reused. Satisfaction guaranteed with MyPresentForYou. Our company's mission is to make you feel great about giving. We want you to feel great about our products and offer a "No questions asked, money back guarantee". TIER PRICING APPLIES. 5% off for 2 or 3 items, 10% off for 4 or more. Click on the 'Add-to-cart' button to purchase NOW. 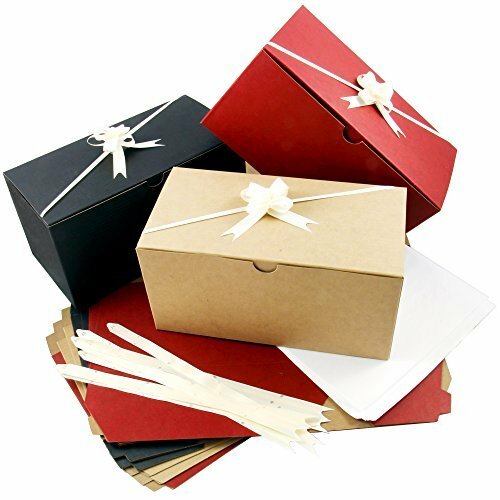 ALL IN ONE: Complete set of 10 Gift boxes (4 red, 3 natural kraft, 3 black), 10 pull bows and 10 sheets of tissue paper. 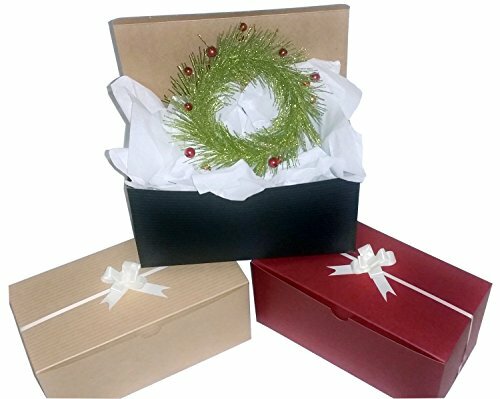 GIFT IN STYLE: These gift boxes are made of one piece and the pull bows are made of smooth poly ribbon. HAPPY HOLIDAY GIVING: Great for Thanksgiving, Christmas, Baby Showers, Weddings etc. Perfect for presents, cookies, bakery products, baby clothing and bathing products. Also used as cupcake boxes. SATISFACTION GUARANTEED: We want you to feel great about our products and offer a "No questions asked, money back guarantee". Due to a quality control issue the black boxes may have slightly different dimensions: 9 3/4" by 4 3/4" by 4"